Idiopathic pulmonary hemosiderosis (IPH) is a rare cause of recurrent diffuse alveolar hemorrhage (DAH) with no specific treatment. Herein, we discuss a case of hemoptysis, who had IPH and other rare associations. A 19-year-old man presented with recurrent hemoptysis, generalized weakness and progressive dyspnea for 3 years. Earlier, he was diagnosed with anemia and was treated with blood transfusions and hematinics. On examination he had pallor, tachycardia and was underweight. Investigations revealed low level of hemoglobin (7.8 g/dl) and iron deficiency. An electrocardiography (ECG) showed sinus tachycardia, interventricular conduction delay and T-wave inversion. Echocardiography revealed dilated cardiomyopathy with left ventricular dysfunction. 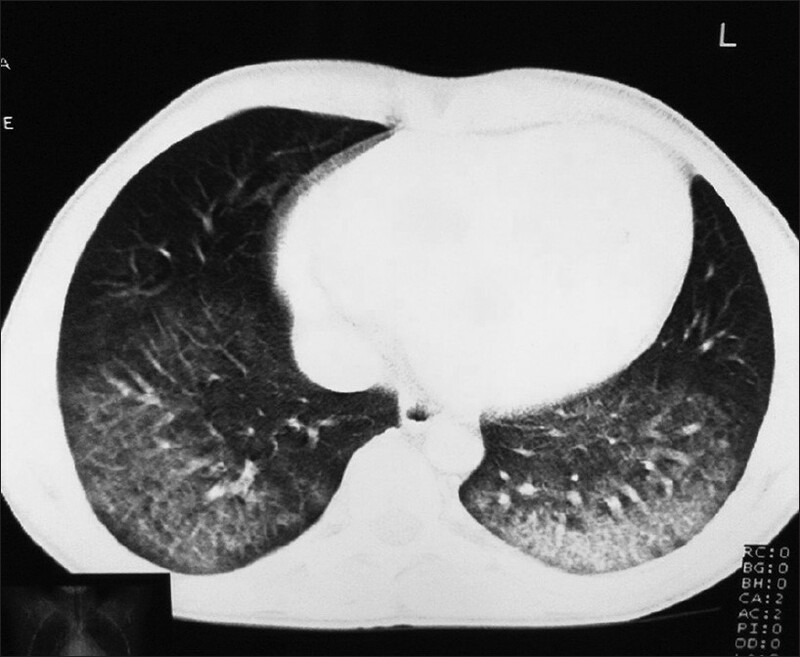 Computed tomography of the chest demonstrated bilateral diffuse ground glass opacity suggestive of pulmonary hemorrhage. Pulmonary function tests showed restrictive pattern with increased carbon monoxide diffusion. 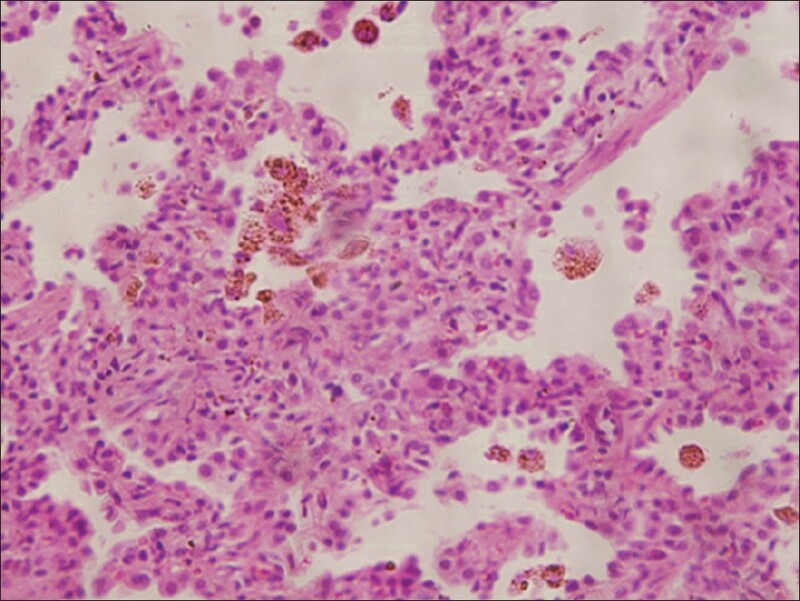 Bronchoalveolar lavage and transbronchial lung biopsy showed hemosiderin-laden macrophages. Patient could recall recurrent episodes of diarrhea in childhood. Serum antitissue transglutamase antibodies were raised (291.66 IU/ml, normal <30 IU/ml). Duodenal biopsy showed subtotal villous atrophy consistent with celiac disease. He was started on gluten-free diet, beta blockers and diuretics. After two years of treatment, he has been showing consistent improvement. Screening for CD is important in patients with IPH. Cardiomyopathy forms rare third association. All three show improvement with gluten-free diet. Idiopathic pulmonary hemosiderosis (IPH) is a rare condition, which causes recurrent diffuse alveolar hemorrhage (DAH). No definite treatment is available, however most case series and reports have reported some response to corticosteroids. It is sometimes associated with celiac disease (CD), which is a primarily a gut condition due to intolerance to gluten. It is important to recognize the association of CD and IPH even in the absence of gastrointestinal symptoms as the treatment with gluten-free diet may lead to resolution of IPH. This decreases the need of immunosuppression and prevents long-term respiratory insufficiency. Dilated cardiomyopathy (DCM) is also reported in association with these two conditions, mainly in pediatric population. This is a case of an adult patient, presented to us with innocuous hemoptysis and found to have involvement of multiple organ systems that is IPH, celiac disease and cardiomyopathy. He showed remarkable improvement with gluten-free diet. A 19-year-old non-smoker gentleman presented to us in January 2011 with recurrent hemoptysis, about 10 ml per day for last 3 years. He also complained of generalized weakness and dyspnea, which progressed from Medical Research Council grade I to grade II. There was no bleeding elsewhere. There was no cough, expectoration, fever or weight-loss. There was no history suggestive of recurrent chest infections, joint-pains, skin-rash, photo-sensitivity, alopecia, oral ulcers, Raynaud's phenomenon or dysuria. Earlier, he was diagnosed to have iron-deficiency anemia and was treated with blood transfusions and hematinics. On examination, he had pallor and tachycardia (heart rate - 108/min). He was underweight (body mass index: 18 kg/m 2 ). Examination of the chest was normal. There was no hepato-splenomegaly. Investigations revealed low levels of hemoglobin (7.8 g/dl), mean corpuscular volume (MCV - 69.9 Fl), mean corpuscular hemoglobin (MCH - 19.3 Pg), mean corpuscular hemoglobin concentration (MCHC - 27.5 gms/dl) and the red blood cells in peripheral smear were microcytic, hypochromic with anisopoikilocytosis suggestive of iron-deficiency anemia. His serum iron was 8μg/dl and ferritin was 4 μg/l. His total iron binding capacity was raised (522 μg/dl). His platelets were 540,000/mm 3 . His liver functions, renal functions, urine analysis and coagulation studies were normal. Sputum examination for acid-fast bacilli was negative. ECG showed sinus tachycardia, non-specific interventricular conduction delay and T-wave inversion (lead 1, aVL, V4-V6). Cardiac enzymes were not raised. Chest radiograph showed cardiomegaly. Echocardiography revealed DCM and left ventricular dysfunction with ejection fraction (LVEF) of 25%. Contrast-enhanced computed tomography (CECT) showed bilateral diffuse ground glass opacities suggestive of DAH[Figure 1]. Pulmonary function tests (PFT) showed restrictive pattern with forced vital capacity (FVC)- 3.05L, 68% of predicted) and increased diffusion capacity for carbon monoxide (DLCO). A diagnosis of DAH was made. Blood eosinophil counts, serum angiotensin-converting enzyme and α1- antitrypsin enzyme levels were normal. Serum markers of vasculitides and auto-immune disorders including rheumatoid factor, anti-nuclear antibodies (ANA), anti-neutrophil cytoplasmic antibodies (ANCA), anti-cardiolipin antibody and anti-glomerular basement membrane antibodies were negative. Bronchoalveolar lavage and transbronchial lung biopsy revealed type II pneumocyte hyperplasia, chronic inflammatory cell infiltrate in interalveolar spaces and hemosiderin-laden macrophages in alveolar spaces. [Figure 2] After excluding all other possibilities, patient was diagnosed as IPH. He recalled recurrent episodes of diarrhea in childhood. His serum anti-tissue transglutamase antibodies were raised (291.66 IU/ml, normal <30 IU/ml). Duodenal biopsy showed subtotal villous atrophy and crypt hyperplasia (Marsh grade IIIB) consistent with CD. He was started on gluten-free diet, beta-blockers and diuretics. At 2-year follow-up, his hemoglobin increased to 10.2 gm/dl and hemoptysis remitted. His body mass index improved (22 kg/m 2 ). Echocardiography (LVEF - 35%) and PFT registered improvement. Figure 2: Photomicrograph shows type II pneumocyte hyperplasia, mild chronic inflammatory infiltrate in interalveolar septa and hemosiderin laden macrophages in alveolar spaces. No viral inclusions were identified. (H and E, ×100). Idiopathic pulmonary hemosiderosis with celiac disease with dilated cardiomyopathy - LANE HAMILTON SYNDROME. DAH refers to bleeding from the pulmonary microcirculation leading to blood leakage into the alveolar spaces. It has numerous causes which can be immune (19-42%) or non-immune (58-81%). , IPH is one of the rare causes of DAH. IPH is an uncommon disease and was originally described by Virchow in 1864 as "brown induaration". A comprehensive portrayal of IPH was given by Ceelen in 1931, also known as Ceelen-Gellerstedt syndrome. The prevalence of IPH is estimated at 0.24 to 1.23 per million. , Adult-onset IPH (20%) is mostly reported in <30 years of age with a male preponderance. Usually it presents as a triad of hemoptysis, pulmonary infiltrates and iron deficiency anemia. It may also present as chronic disease with weight loss, growth failure, iron-deficiency anemia and respiratory impairment. Diagnosis is made by exclusion of other causes, as was the case with our patient in whom no other cause of DAH could be found. Histologically, the alveolar spaces contain erythrocytes and hemosiderin laden macrophages. PFT show an increase in DLCO and a restrictive pattern. IPH is occasionally seen in association with CD. This was first described by Lane and Hamilton in 1971 and is recognized as the Lane-Hamilton syndrome. In a study by Khemiri et al., that screened patients with IPH for CD, an association was found in 44.45%. Two other studies by Kiper et al., and Le Clainche L et al., showed that the two conditions may be associated in 6.6-8.7% cases. Both CD and IPH are believed to be immunologically mediated; however, the pathogenetic link between the two conditions is not clear. Several hypotheses were put forth, which include the deposition of circulating immune complexes from food allergens on the basal membrane of alveolar capillaries. In one of the case reports, although evidence of circulating immune complexes was found but evidence of damage to alveolar capillaries was not observed. The cross-reaction between the anti-reticulin antibodies and the alveolar basal membrane antigens, and the effect of adenovirus 12 were other possible mechanisms. Most of the cases were present with respiratory complaints or anemia. Patients generally have no gastrointestinal symptoms pertaining to CD. More than 50% of patients show remittance of respiratory symptoms only with gluten-free diet. This highlights the importance of recognizing this association at early stage. Cardiomyopathy associated with CD is rare and till date eight studies have reported this association. A recent study by De Bem et al., in which 12.18% cases of cardiomyopathy were reported to have CD have recommended screening for CD in all patients with DCM. Not et al., studied patients (238) and the relatives of patients (418) with idiopathic cardiomyopathy and found that CD seems to be associated but not co-segregated within familial cases. Frustaci et al., showed high prevalence of CD among patients with idiopathic congestive heart failure and biopsy proven myocarditis. Our patient also showed systolic dysfunction with LVEF as low as 25%. Only one such case has been reported in the literature previously. Mechanisms for pathogenesis of DCM in CD include nutritional deficiencies, infections and immune-mediated insults. Not et al., suggested that co-morbidities like iron-deficiency anemia in patients with DCM should arouse suspicion of CD. Cardiac functions improve with gluten-free diet as was the case with our patient. IPH, CD and cardiomyopathy rarely occur together. If a patient has IPH, CD should be investigated even in the absence of gastrointestinal symptoms. Similarly, all patients with idiopathic DCM should be investigated for CD with anti-tissue transglutamase antibodies and if positive, a biopsy may be performed; though there is a general preference for a non-invasive approach to the diagnosis. Gluten-free diet is the most effective intervention for management of these patients. Ioachimescu OC, Sieber S, Kotch A. Idiopathic pulmonary haemosiderosis revisited. Eur Respir J 2004;24:162-70. Sethi GR, Singhal KK, Puri AS, Mantan M. Benefit of gluten-free diet in idiopathic pulmonary hemosiderosis in association with celiac disease. Pediatr Pulmonol 2011;46:302-5. Narula N, Rawal P, Kumar RM, Ram Thapa B. Association of celiac disease with cardiomyopathy and pulmonary hemosiderosis. J Trop Pediatr 2010;56:201-3. Picard C, Cadranel J, Porcher R, Prigent H, Levy P, Fartoukh M, et al. Alveolar haemorrhage in the immunocompetent host: A scale for early diagnosis of an immune cause. Respiration 2010;80:313-20. Rabe C, Appenrodt B, Hoff C, Ewig S, Klehr HU, Sauerbruch T, et al. Severe respiratory failure due to diffuse alveolar hemorrhage: Clinical characteristics and outcome of intensive care. J Crit Care 2010;25:230-5. Müller KM, Fenyves A. Changes in the pleura and review of idiopathic pulmonary hemosiderosis Ceelen Gellerstedt disease. Pnemuologie 1991;45:23-7. Ohga S, Takahashi K, Miyazaki S, Kato H, Ueda K. Idiopathic pulmonary haemosiderosis in Japan: 39 possible cases from a survey questionnaire. Eur J Pediatr 1995;154:994-5. Kjellman B, Elinder G, Garwicz S, Svan H. Idiopathic pulmonary haemosiderosis in Swedish children. Acta Paediatr Scand 1984;73:584-8. Lane DJ, Hamilton WS. Idiopathic steatorrhoea and idiopathic pulmonary haemosiderosis. Br Med J 1971;2:89-90. Le Clainche L, Le Bourgeois M, Fauroux B, Forenza N, Dommergues JP, Desbois JC, et al. Long-term outcome of idiopathic pulmonary hemosiderosis in children. Medicine (Baltimore) 2000;79:318-26. Ploier R, Emhofer J, Dorninger L, Kranzl G, Feichtinger J, Muller KM, et al. Immunological aspects of a child with idiopathic pulmonary hemosiderosis and celiac disease. Klin Padiatr 1998;210:409-12. Agarwal R, Aggarwal AN, Gupta D. Lane-Hamilton syndrome: Simultaneous occurrence of coeliac disease and idiopathic pulmonary haemosiderosis. Intern Med J 2007;37:65-7. De Bem RS, Da Ro Sa Utiyama SR, Nisihara RM, Fortunato JA, Tondo JA, Carmes ER, et al. Celiac disease prevalence in Brazilian dilated cardiomyopathy patients. Dig Dis Sci 2006;51:1016-9. Not T, Faleschini E, Tommasini A, Repetto A, Pasotti M, Baldas V, et al. Celiac disease in patients with sporadic and inherited cardiomyopathies and in their relatives. Eur Heart J 2003;24:1455-61. Frustaci A, Cuoco L, Chimenti C, Pieroni M, Fioravanti G, Gentiloni N, et al. Celiac disease associated with autoimmune myocarditis. Circulation 2002;105:2611-8. Mah MW, Priel IE, Humen DP, Brown NE, Sproule BJ. Idiopathic pulmonary hemosiderosis, complete heart block and celiac disease. Can J Cardiol 1989;5:191-4.